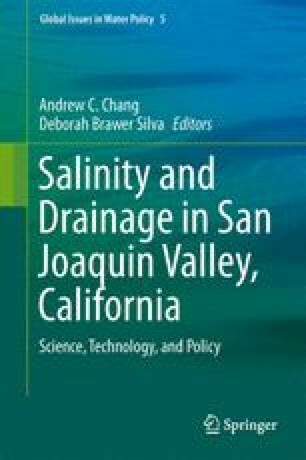 Reuse of drainage water for irrigation is recognized as a viable means of reducing the amount of saline-sodic spent water that will ultimately require treatment or disposal in the western San Joaquin Valley (SJVDP 1990). This practice is not a long-term solution in itself, but rather an integral component to drainage water management in the San Joaquin Valley. For reuse to be successful, soil salinity and boron (B) cannot accumulate to levels damaging to crop growth; soil physical conditions conducive to water infiltration must be sustained; and trace element accumulation in crops and forages must remain low enough not to threaten the health of humans or livestock (Oster and Grattan 2002). Benes, S., Grattan, S. R., Finch, C., & Basinal, L. (2004). Plant selection for IFDM. In: T. Jacobsen & L. Basinal (Eds. ), A landowner’s manual: Managing agricultural irrigation drainage water. A guide for developing integrated on-farm drainage management systems (pp. 6–1 to 6–21). Fresno: California State Water Resources Control Board. Hudson Orth Communications. http://cit.cati.csufresno.edu/DrainageManual/Content/Chapter6.pdf. Accessed June 2012.